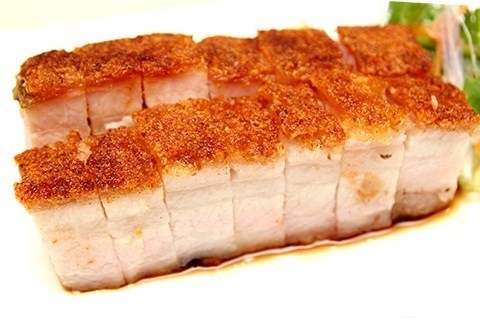 In other parts of Indonesia and also Malaysia, where the Chinese are the main pork-eating population, babi panggang may simply be a local term for standard Chinese pork dishes - babi panggang putih is siu yook ( 燒肉 ), and babi panggang merah is Chinese char siu ( 叉燒 ). In the West, chiefly in The Netherlands, babi panggang is a pork dish served with a tomato-based sauce. This Dutch/Indonesian/Chinese fusion dish is also known as babi panggang speciaal in the Netherlands and its neighbour Flanders, and the sauce as speciaal saus (read: "special sauce").